Updated June 2011 – As the FLAG website can now be used to create Mobipocket files it’s much simpler. You can then read your Mobi file on your Kindle or Kindle app on your other devices. I preface this as someone who does not own a Blackberry or Kindle and having a husband who owns a Palm which uses Windows. 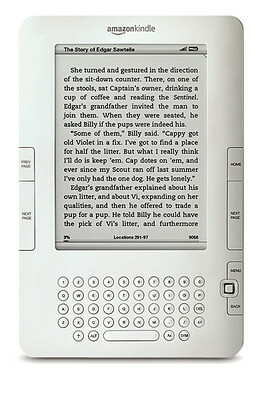 Kindle users can convert fanfic into mobi or prc file format and then transfer them onto their Kindles. Blackberry/Palm/Windows Mobile users can read mobi files using Mobipocket eReader for their devices. There is a Kindle for Blackberry as well. I’m assuming there must also be apps out there now for the above devices that read epubs as well – please let me know so I can add these! Now to create mobi files…. Use the websites FLAG or Fanfiction Downloader appspot to creates HTML or epub files. Then convert to mobi with Mobipocket eBook Creator or Calibre. For fanfiction.net – Type in the Story ID number from the fanfiction.net story you’d like to save. For example the Lolashoes classic “Let Your Light Shine” story had this URL http://www.fanfiction.net/s/4837355/1/Let_Your_Light_Shine – The story ID is the highlighted 4837355. For Twilighted.net – Type in the story URL. Click Get and wait for the file to download. Next you can use desktop software Calibre or Mobipocket eBook Creator to convert it into a mobi file. Update – now conversion needed – you’ve already created a Mobi file! For questions or corrections please email TwilightCupcake at twimobile(at)gmail(dot)com. I was wondering if you still have a copy of Master of the Universe. The story was pulled from the web because she’s going to be published, but we have about 6 friends that were in the middle of reading it. I have looked around a lot for it, but can’t seem to find it. Any help would be awesome, ty. Unfortunately I’ve promised the author that I would not distribute her work. She is publishing it now and you should be able to find it in paperback soon!